The most basic piece of a breadboard computer is, of course, the breadboards. I found some Elegoo brand 3-packs on Amazon with primarily positive reviews for less than $10 and snagged a couple, along with some other Elegoo kits which each came with one breadboard. I was not impressed at all with their quality. The clips were misaligned so that inserting leads was tedious-to-impossible. Their own brand power modules, which have a DC jack and plug into the power rails on a breadboard, would not fit without some extreme jiggling & pin bending. I left a one-star review and they sent me replacements hoping I'd reconsider. At first they seemed much better than the original set. But while they didn't have the same frequency of issues, they still had problems. For one thing, the DIP switches I got will not stay in the holes at all. Tactile switches are similarly hard to keep in. By comparison, a breadboard that came with an electronics kit years ago holds onto these with enough force that they were more difficult to remove than insert. All but two of the breadboards had their "top" power rail sliced off (the slicing is just through the double-sided tape; they're otherwise joined by plastic tabs). The boards and power rails were joined together in two chunks each. I cut some pieces of hookup wire to connect the power & data buses together. The clock is a 555 timer. The second 555 is for de-bouncing the manual clock button. I'm planning to use a different design that only needs a single 555, but I need a SPDT switch, not just an OFF-(ON). Data Pointer and Data Register/ALU are made of Binary up/down counters (74LS193). This naturally represents the fundamental Brainfuck operations of +, -, >, and <. The Data Pointer pictured here has only 3 of the 4 chips needed to address 32 K of RAM. A handful more of these chips should be arriving this week. A + instruction will cause the Data Register to increment. A - will cause it to decrement. A > will cause the Data Pointer to increment. A < will cause it to decrement. Values will be transferred to/from RAM whenever necessary. Stack Pointer is also made of 193s to handle Brainfuck's [ and ] instructions. The location to jump to will be stored when entering the loop. An alternative design would be to keep a depth counter and decrement PC until depth goes down, but looping should be constant time for remotely reasonable performance. The Program Pointer also uses 193s; It never needs to count down, but the other binary counters in the kit are ripple carry and can't be loaded directly with data. It needs to be able to load a program counter location from the Stack Pointer. Data and Stack RAM are made of 32 KB ram chips (CY7C199-35PC). Stack needs 2 of them to handle the address width of the Data RAM. The two chips will have address lines in common, so it acts as a single 32 K x 16-bit memory. 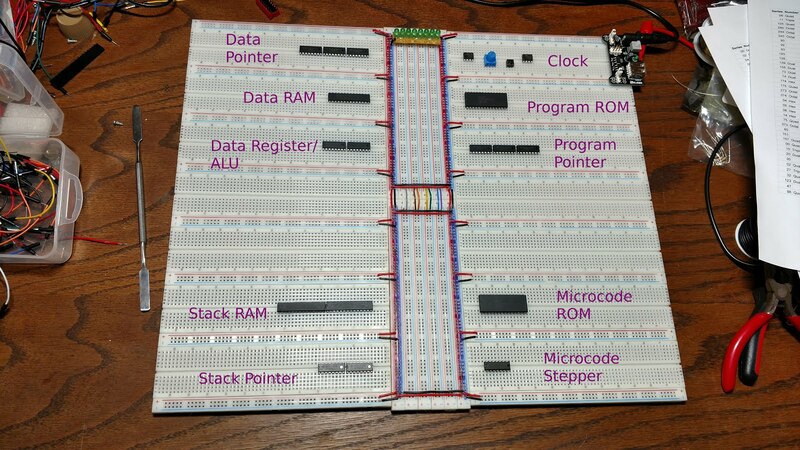 The microcode stepper is a J/K flip flop to toggle between micro-instruction steps. The Program & Microcode ROMs are 32 KB EEPROMs (X28C256P-15). This is massive overkill for the Microcode. I shouldn't need more than 8 bits per instruction and Brainfuck only has 8 instructions. I may end up doing the microcode with discrete logic gates just for the challenge.